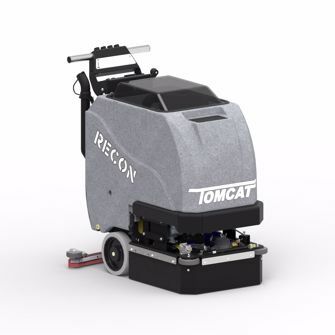 The Tomcat RECON floor scrubber was designed to be simple and compact while not holding back on power. This commercial scrubber can clean up to 2.5 hours continuously with help from its 10-gallon solution tank. It would make a great addition to just about any facility – school systems, healthcare, warehouses, grocery, retail, airports – and it will fit in your supply closet! The RECON is available with 17” or 20” disk brush heads making it easier to maneuver in smaller areas. Pad Assist – requiring some physical effort to push, the pad assist driven machines use the scrub head to move forward. The 500 lb. max scrub pressure and high performance motors provide the highest standards of cleanliness. Dimensions (LxWxH): 35" x 18" x 38"